The famous Queen Victoria set the tone for Britain’s era of industrial expansion and empire. Though often recalled as wearing black mourning clothes and having a strict code of morality, she was said to be warmhearted and lively. Her reign lasted nearly 64 years, and influenced the centuries to come. Born on the 24 th of May 1819, Alexandrina Victoria grew up to become the longest reigning monarch in the history of the United Kingdom. On the 20 th of June 1837 she became queen of the United Kingdom of Great Britain and Ireland and she reigned until her death on the 22 nd of January 1901. She also held the title of Empress of India. The daughter of Prince Edward, Duke of Kent and Strathearn, fourth son of King George III, the young Victoria was at first called Drina, a short form of Alexandrina. In time, the people around her began to call her Victoria more and more often. She was raised under the strict supervision of her mother, the German Princess Victoria of Saxe-Coburg-Saalfeld. Her father died when she was young and so did King George III. 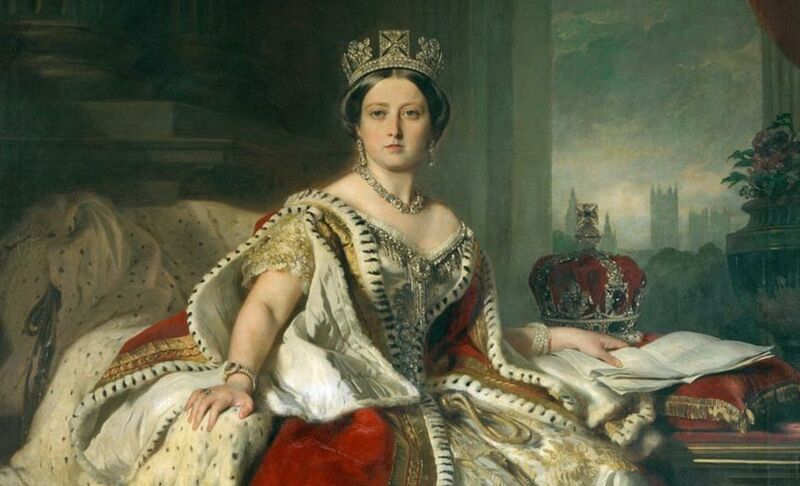 After the death of her father’s three elder brothers, at the age of 18, Victoria inherited the throne and became queen. At this time, the United Kingdom was a constitutional monarchy, a fact which meant that the sovereign did not have too much real political power. In private, Victoria influenced ministerial appointments and government policy, while publicly she became a respected national icon. She was especially revered for her strict standards of morality. In 1840, Victoria married her first cousin, Prince Albert of Saxe-Coburg and Gotha, out of love. It was said to be the perfect love match and the two cared about each other sincerely and deeply. They had nine children and they all married into noble and royal families across Europe. As the monarchies of Europe became tied together by these bonds, Victoria earned the nickname “the grandmother of Europe”. Upon Albert’s death in the year 1861, Victoria was distraught. She entered a period of deep mourning and stubbornly avoided public appearances. Her seclusion resulted in an increase in power on the side of the republicans, but this did not last for long. During the latter half of her reign, the queen’s popularity recovered and her Golden and Diamond Jubilees were celebrated with great joy and grandeur. Her reign of 63 years and seven months has come to be famously known as the Victorian Era. Queen Victoria’s time has been characterized by cultural, political, industrial, military and scientific change and it marked a great expansion of the British Empire. Victoria was the last British monarch of the House of Hanover, her son and heir, Edward VII, belonging to the line of his father, namely that of the House of Saxe-Coburg and Gotha. Queen Victoria is still remembered today as the longest reigning monarch of the United Kingdom, having only recently been eclipsed by Elizabeth II. Her time marked an era of development in many different domains and a time when culture flourished and industry prospered. Victoria is also remembered for her impeccable sense of personal morality and for her deep and profound love for her dear husband, Albert. Throughout time, her image has inspired artists, novelists and filmmakers and she is not likely to be soon forgotten. A. N. Wilson. “Victoria: A Life” 2014. Published by Penguin Press. Christoper Hibbert. “Queen Victoria: A Personal History” 2001. Published by Da Capo Press; Reprint edition. Members of the modern British monarchy might be described as calcified drones, yet when compared to the repugnant types given high status in the US by the media...wealthy industrialists, sleazy Hollywood elites and profane former government officials unable to tell the truth even in matters of life and death...the Royals have a soothing class absent in our country.